The Little Giant Defender™ was specifically engineered for firefighters who need speed and strength in a rapid-response portable ladder system. The Defender firefighting ladder is designed to fit existing storage spaces in most fire engines and is lighter than any comparable industrial-rated ladder. The Defender also includes several innovative new features, such as the Quad-Lock™ hinge and the Rock Lock® rung fasteners for quick, easy adjustment with heavy firefighter gloves. The Defender can be used in dozens of unique configurations as an A-frame, extension, staircase and 90-degree ladder, and as a trestle-and-plank scaffolding system. The Defender’s wide-flared legs and sturdy aluminum construction provide unmatched safety and stability. The Defender also features Little Giant’s new, patented dual Ratchet Levelers™. Ratchet Levelers adjust hands-free in seconds. These integrated levelers are extremely quick and easy to operate. Simply extend the levelers with your foot until the ladder reaches a level, stable setup. The levelers offer nearly 8.5 inches of leveling adjustment, and allow you to adapt your ladder to nearly any uneven surface in only seconds. The Defender firefighting ladder has high-viz reflective labels and heat-sensor labels that indicate when it has been exposed to too much heat and should be taken out of service. The Defender also features heavy duty casters to make transport faster and easier. The Little Giant Defender is rated to hold 300 pounds on both sides and can be used as a true two-person stepladder. The Little Giant Defender ladder system is designed to meet the requirements of NFPA 1931-2015, Standard for Manufacturer’s Design of Fire Department Ground Ladders, and has been tested to the requirements of NFPA 1932-2015, Standard on Use, Maintenance, and Service Testing of In-Service Fire Department Ground Ladders. Little Giant’s Defender and Overhaul™ ladders are the only articulating ladder systems that meet the requirements of NFPA 1901-2009, Standard for Automotive Fire Apparatus, section 5.7.1.3 for pumpers, section 8.7.5 for ladder trucks, and section 9.7.1.3 for quints. The Little Giant Defender Firefighting Ladder meets ISO requirements for credit on pumper and ladder apparatus. 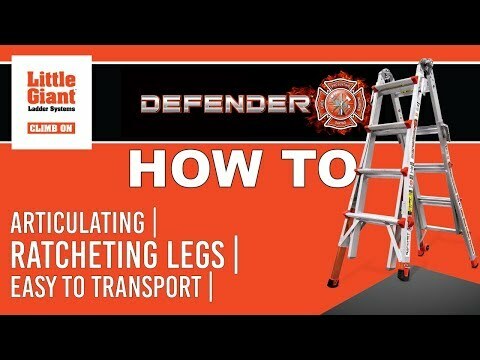 The Defender Ladder is available in 17 and 22-foot sizes. Weight Capacity 300 lbs. 300 lbs. A-Frame Min. Height 4 ft. 5 ft.
A-Frame Max. Height 7 ft. 9 ft.
A-Frame Max. Highest Standing Level 4 ft. 9 in. 6 ft. 7 in. Extension Min. Height 9 ft. 11 ft.
Extension Max. Height 15 ft. 19 ft.
Extension Max. Highest Standing Level 11 ft. 7 in. 15 ft. 6 in. Storage Height 4 ft. 7 in. 5 ft. 7 in. Storage Width at Base 2 ft. 2 ft. 3.5 in. Storage Depth 9 in. 9 in. Rung Size Single Section Inner: 1.5 in. Outer: 1 in. Inner: 1.5 in. Rung Size Double Section 2.75 in. 2.75 in. Ladder Weight 46 lbs. 46.5 lbs. Shipping Weight 51 lbs. 54.4 lbs.